I bought rod-end bearings that have pre-made studs in the balls, like on my original tailwheel setup. But they don't have holts in the threads so I can use a castle nut. I needed to drill an precise and centered hole in the two threaded bolts, so I used a piece of scrap aluminum bar to make a drill bit guide. 1. Put bar in vice (a vice made to sit on a drill press table). 2. Drill a hole through the bar. 3. Mark the center line of that hole, along the wide face of the bar. 4. Carefully drill a hole centered on that line, though the wide face of the bar. Size it to take then take a tap for the thread size you need to drill. In my case a 1/4-28. 5. Tap the hole for the threads. 6. Screw the bolt into the tapped hole, adjusting the depth to get the vertical hole where you want the hole in your threads. 7. 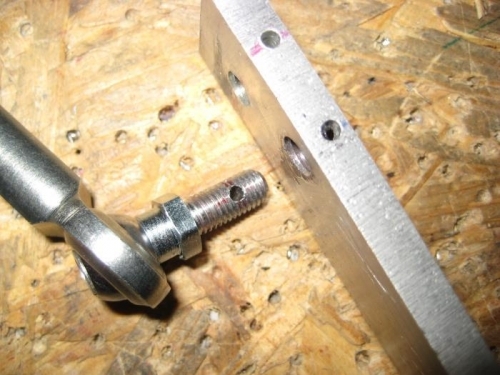 Use a nut on the end of the bolt to hold it in place. 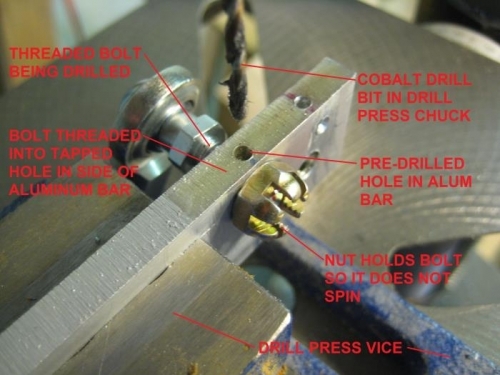 If you don't do this, then the bolt will try to spin in the tapped hole as soon as the drill bit touches the threads. 8. Align the vice and the pilot hole directly under the drill press bit and clamp down the vice. 9. 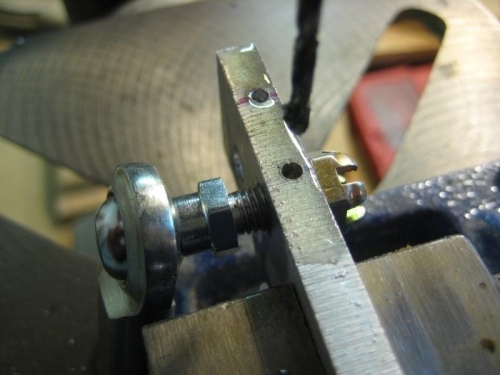 Use a Cobalt or similar bit to get through the steel bolt. 10. Use cutting fluid and back the drill bit out every now and then to clear the chips. 11. After removing the bolt use a non-locking nut to clear the burrs from the bolt threads. Screw it down past the hole then back it off. Drill guide in vice, clamped to drill press table. Same thing, looking in the other direction. The resulting hole after backing out the bolt.